This morning in downtown Manhattan, I saw a Red Bull car with a flat tire. Heh. I guess Red Bull really does give you wings! Hey what are you doing in NY? ^ With the producers of "Treme" editing the pilot. ^ Oh, that photo isn't Manhattan. 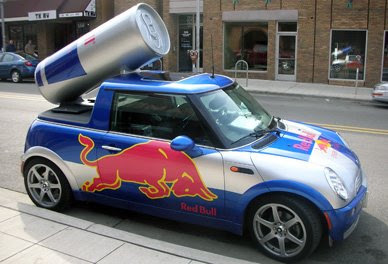 That's just a random Red Bull car image... in case somebody didn't know what a "Red Bull car" was. How long have you been in NYC? I was there on the weekend, but was looking for a good (or bad) excuse to stay for a few Tribeca events. A chance to finally meet up with you would have pushed me over the edge. Heads up next time you are in the area. ^ I got in Sunday evening. Had no idea you spent so much time in NYC.